To provide your horse with the optimal fit, comfort and protection that it deserves, it is important to select the most appropriate rug for your horse. 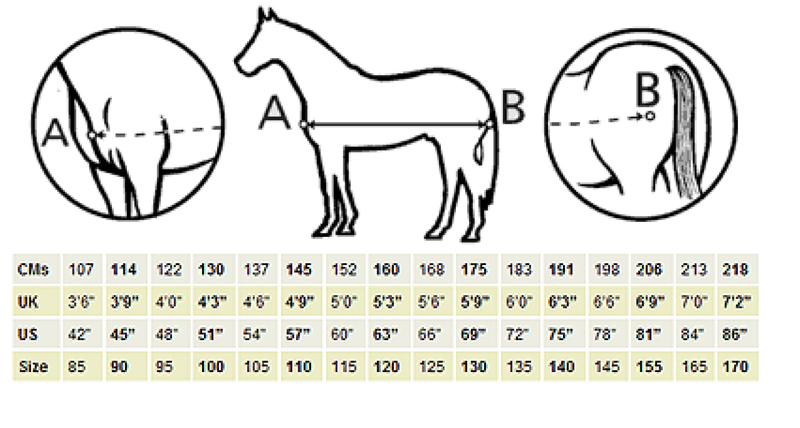 The following instructions outline a step-by-step approach to measuring your horse for a Bucas rug to provide an optimal fit, comfort and ease of movement. Bucas recommends that the horse be measured from (A) the centre point of the chest, over the high point of the shoulder, and then to (B) the rear of the hind leg. When you have the measurement, choose the nearest size from the table below, or email: admin@bucas.com and we can post a Bucas measure tape to you. *Please note that it is the measurement of the horse that determines the size.